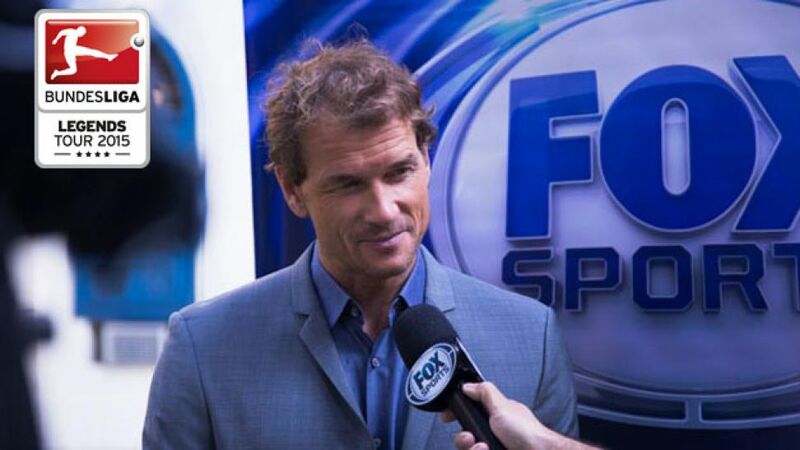 Cologne - It’s been non-stop for Jens Lehmann on the Bundesliga Legends Tour 2015 in the Americas. After spending time in New York and Mexico City, the retired Germany international goalkeeper rounded off his six-day trip promoting and watching the Bundesliga in Rio de Janeiro. Lehmann’s second day in Rio kicked off with a trip to the office of the consulate general of Germany, where he fielded a range of questions from local journalists pertaining to the Bundesliga and his experiences as a professional footballer. Later that morning, he was joined by 200 guests, including fans, employees and presenters at Fox Brazil and former Hertha Berlin player Gilberto Silva, for an afternoon of Bundesliga-themed goodness. Lehmann went live on the air to offer his expertise during half time and again at the final whistle of 1. FC Köln’s 3-1 win over one of three Bundesliga clubs the footballer-turned-pundit represented as a player, VfB Stuttgart. The 45-year-old, along with Silva and Consul Klein, also took part in a fun-filled game of target practice, before boarding a plane bound for Germany at 22:00 (local time), his mission to spread the Bundesliga message across the Americas complete.